You should sign up with @Influenster to become a product reviewer! Unlike some programs, I received this FULL-SIZED product sample kit worth a total over $75.00 if purchased at a discount retailer! (Yes, I went to price shop these items.) You are under no obligation to give these products a good review. I must admit the Pantene Pro-V Age-Defy shampoo and conditioner have both brought added strength and shine to my hair abused by my dryer and flat iron. 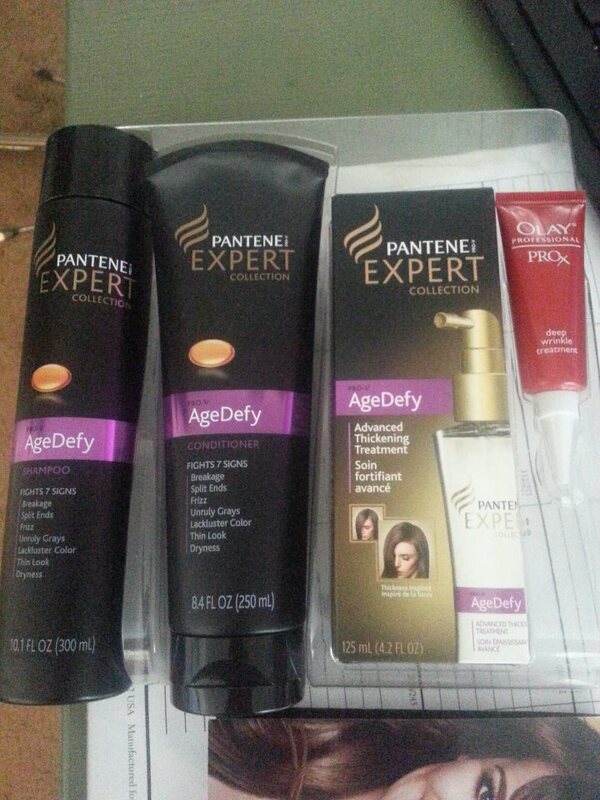 My mom has been using the Pantene Pro-V Expert Collection AgeDefy Advanced Hair Thickening Treatment. I don’t know about the hair appearing thicker, as much as it does appear more manageable and smoother. The Olay Professional Pro-X Eye Restoration Complex had the most noticeable improvement. After washing my face and removing any soap residue with a mild toner, I dab the eye complex under my eyes. When I did just one eye for the day, I could see a definite difference in the treated eye, which looked more dewy with less fine lines.